A maximalist, post-apocalyptic, neo-Victorian steampunk zombie novel in which a girl, whose blood is impervious to the “Z-virus,” searches for her missing dad, is kidnapped by (good) zombies, falls improbably in love with a rather sweet zombie boy, and sets out to save the world from a zombie plague beyond imagining. As far as romantic pairings go in the year 2195, you don't get much more unlikely than an upper-class schoolgirl and a poor miner from enemy tribes. Filter in the fact that he's a zombie, and you're definitely talking about star-crossed love. 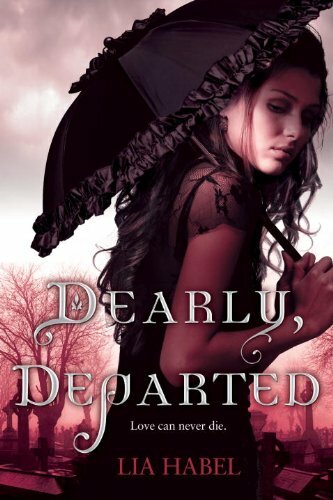 Dearly, Departed is a cyber-Victorian/steampunk romance that takes place in the shadow of a new ice age. Nora Dearly, a mouthy teenage girl and apparent orphan, leaves school for Christmas - only to be dragged into the night by the living dead. Luckily for her, though, the good ones got to her first. From her reanimated rescuers she learns not only that zombies are roaming the countryside, but that her father is one - and that he's in terrible trouble. She also meets Captain Bram Griswold, a noble, strong, and rather sweet undead boy for whom she starts to fall. Meanwhile, her best friend, Pamela Roe, is just trying to carry on with life as best she can in the wake of Nora's disappearance - when she ends up killing an evil zombie in self-defense. Pam is galvanized into action, and ends up leading a group of survivors as the city of New London is thronged by the ravenous dead. Upon hearing of Pamela's plight, Nora and Bram set out to rescue her friends, find her missing father, and maybe just save what's left of the world. I adore the cover too :) . This cover is so gorgeous.